We are The People, the people of the human world, and we are life together in One country, The One World, every one member of the global human group, and every one of us is naturally equal human, naturally the same ideologies and our life need's, obligation's and life principles, when a human union is a symbol for the world, where no human have a difference between us, We are a People, The Human's, we are together life in One World, and therefore our goal of development is equal order union of the nation for every one ! The millennia of the human generation's, Every one state rise in the beginner, on the alliance development, connection between geographically local group's in the available distance, the people union first time and together declare first existence of the micro state, micro nation, society of the people, movement and primary kind on the civilizational centralization. The micro states build the center of their civilization, the city or village, town. People develop their society, commune and regime order, who regulate function of intelligence according the natural principles of the human communal intelligence, the need's of people for common mobilization in the kind's of food production, education, culture, right of all people in the democracy power opinion and their dominance which protect their right's and need's according primary human natures. Al first communities, or advanced government's have the same natural need's, and therefore the same principle on the idea for the central state development, the government and jurisdiction of country, when the first obligation in the vision of development is, the system which can stabilize their communal function, and this is a Prime Rule of all political existence in the world. All people have the same need's, every nation in the world is lawfully equal. Today modern time, the nation's of town is in unity, on the next level of natural state formation, in the time of the transportation between cities, post communication and data sharing, also common source use and intellectual development, people unite and use their own progress for their own strength and stability, because in the union is power and better stability of their life, also all nations is equal in order of natural need, and therefore no one need prevent their unification. The nation of country, first city, after connection between cities create region, and region consist the provinces, when union of provinces create our today form of the state, one unitary state of a country. People have natural function for their own development, according principle of the expansion and grow on the idea for the unity, the principle which is confirmed by the history of all nations in the whole world, also with the confirmation on the central state development function which have a time limit according natural function of human mind, also our level of civilizational ability for long distance connection, and also true on the right for a peace opinion, when only peaceful nation stand in the unity and equivalence of states and their order of the natural rule for The One State function, bud another verse, the states in the conflict, war and hate stand only in the opinion of own development according running for destruction and war against those all who is not today actual members of their nation, also the people who are stand in the only opposition, and therefore the people who are only strength their own boards and isolation, their own function as nation of prison, the nation of own complex on self destruction, because people don't can use their own natural mind, and they are prevent their development and natural way for expansion, when also no body in the world can welcome similar nation and no one have interest to by united with such a kind on the problem. Third Rich of Germany, Italia in time of Mussolini, the Soviet Union in time of Communist dictatorial era, Chinese popular republic in time of the Mao regime, Napoleon and all states in the war for territorial profit, stand only for their own capacity and time lose because they are prefer the war and killing, no friendship communication and slowly development the partnership between nation's which at an one day consist in the States declaration on the National Union, federation and unitary function. We are people, we today life in the moment, when our natural way of the state development, create from time of micro nations in form of villages, expanded on the level of cities, level of the regions and provinces, today our states, together we are again stand with a vision for a new horizon on new connection on the International level, and the new unification between nation's, also we can publicly observe such effect of new ability for human future, when our world political form is again developed globally in separation, bud also globally under the same natural principles of people need's, and therefore all states have their own common interest for the future, the same equal unity and existence. The trade connection is first proof on the primary act on the states unification, when we are today life in the time of the global trades and nations and people, the societies and companies with a global affairs of the business relationship and development. Also we can observe our unity of people, our connection in the role of the partnership between nations and states, no prohibited connection and open space for our communication, level of civilization with give us right for send a letter in the post message, also @-mail, inter-net chat, telephone and telecommunication, the whole world active use and develop such kind of infrastructure of global connection which again symbolize and confirm in proof, that our world is in the social level of people realy function and active as the One World, One Country and One Nation. We are people in our natural principle of social company, we are life in The One World. Today time, also the affair's of policy, rule between nations, we develop our connection in ordinary principle which defend the right of every state equally, prevent the conflict and war, stabile maintain all functions which connect our nations and confirm the true opinion on the unity of our states in the social sphere, the One World, also the rule which again confirm, that our governments have a common relationship ability, and we can also again observe our slow way for the stronger partnership and unification, the unification step by step, first in trade relation, social company connection, information share, common supports for development, agreement on common building by a dual power, also the rights and the rules in the declarations and treaties which open the ability for unity between our countries and nations, also every day the rule and treaties, strength and strength in the power of common relation and such capacity on the unification of our worlds. Future step of our nations is again unity between us, and today first act's on our global future is the public confirmation, open for knowledge of every one, the system which grow new states in the dimension of the continental unions, and next level the state of world continental unification which consist The One World. The states as United States of America, Mexican Federation, Brazil Federation, Russian federation, Malaysian federation, also in the proof of the people advanced existence in our natural way of unification is mostly, The Organization of American States, African Union, Council of Europe and also true the United Nation's organization, as the political centers of states which create continental alliances, and common order of the connection, when the institutions of countries have a right for their connection and relationship, the people have their connection in the tourism and transport affair, common source and trades, shared cultures and intelligence, common protection and also people life under the same continental order of the multi dimensional state across the continent. 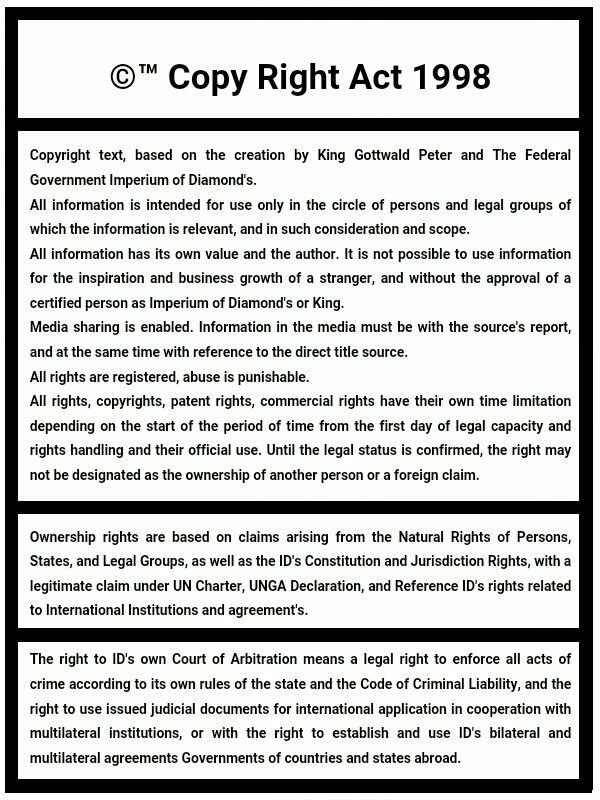 The Federal government Imperium of Diamond's represent the same own idea on the development and expansion, expansion in the name of all states equal and their pride, no war and no conflict, we prefer only democracy and diplomacy, peaceful union. Our vision of the political and civilized level is much advanced than the today time our horizon of way for the unity of the nations, in the continental unions and state. We are is the new generation, and we are represent the idea of The One World, One World government and policy, our goal is develop the global unity between every nation and states, our unitary cooperation and one rule of our state across the globe. Our goal is develop the strategy of world centralization, unite all civilizations and states, open a new progres in our world political and civilizational development, and outstrip our next step of continental unions and state development, when our success is a step on the global unity, the world people unification and our common power of the mankind, people in one unity and therefore also in such power ! Open the whole world, no here will be established border's, no where will be here foreign state competition, and all nation's life equal and developed together, no any science secret or competition clearance on opportunity for development, we can build our civilizations without stop, openly and actively, every rule under our real need's without need on International synchronization, we are together can life the real world according our real human intelligence development, our real need's without clearance of the opportunity for development which in consequence only lose on our own civilizational values in the lost value of hundred's of year's. The Unity of all states is a Most important progress for world security, eradication of poverty, prevent all wars and foreign opposition or dominance risk, we are is a global progress which can stop more than 95% of the today world problems, crisis and risk's, our world is only better when no body can lose in our unity, bud also we are is together much strength and powerful, developed and successful, and in the mean true, according natural vision of our people of the Earth, all people naturally and primarily vote for best peaceful opportunity, and best development option, also the best strategy for the freedom of all man and success of life for their families. We represent the political development which want every people, because this is our most natural principle of our own existence, and no body of us can stop it, because this is a way of a mankind, and this is a way of all future generation, the same practice as the millennial development all our past generations which build and develop our today world, long time great progress from first villages, cities and towns, today Continental union's of states ! The Imperium of Diamond's, we are don't represent nothing more than only, the principle of the world human natural existence and such principle of the development, we are stand for the new world which have a prosperity for every one ! The Government represent ideology of the World Unity and freedom of the people, the government represent and use own strategy for world mobilization and the peaceful centralization of nation's, peaceful centralization of the states and government's. Today, our world is decentralized, we are life separated in the countries, under border's of the regime, because our civilizational level in past centauries don't allow us, open stabile international connection, we don't know foreign languages, and we don't know all territories and all nation's in the world, we life in the un-touchability between us, and therefore we are here lose on our important opportunities for unity and common relationship development in the level of the globe. Today we are life in open world, global transport routes, common law's on International level, world business connection's, world united media and shared inforation's, open telecommunication, Internet infrastructure and our global connection, global meeting's between people and societies, political parties of our nation in the world club's coalition's and also the government's with their own order of the policy and state, in equal formation and principles of state. The Head of state, Prime Minister of Government, Congress or Senate, Ministries and also Parliament, states with their jurisdiction and civil system with a services, the Police, Armies, Doctor's, School's, Business people and Companies, this is our One World Global act on unification, when only one last act on our difference and separatism is established in the opinion of vision of one political party which establish their order of regime and declare boards, the boards made be the fear of unknown people in foreign, and risks of the criminal opposition, foreign abuse on information and also many times terrorism or violence. The Government, therefore develop own Constitutional form on the federal base, which can allow our unity of states, in the untouchable function and also stabile separate legal name and stabile integrity of every state in the union, the federation. When people and states join the federation, people can observe their right in the federation, their opportunity for connection, also control true function of the country and ideological opinion's, peaceful interest without any threat or risk on the infiltration, colonization of their nation, false connection for purpose to overthrow of their government and the slavery of their people, also in the risk of their racism discrimination and apartheid. We don't prefer any kind of the slavery and blockade agains't people, and when only such opinion or consequence will by written in the law, therefore such principle lose on own validation in legal affair, and new rule is establish under the principle of equal justice for every one, the unity and strategy for a peace of people. Our constitution must use strategy for development according the praxes of the unity and the relationship, equivalent rights for every nation, also full open space for all government's and under the best options of their own form of the government. We don't recruit people and their political existence, we only unite and maintain our partnership in the connection's between us, which strength our unity, and also we use strategy for our central development according our federal democracy and our votes for the best inspiration from all observed system's of political administration and codes of states in the federation, we therefore together stand for development of the super governmental form which is consistent of the best option's on the political ideologies, order's and active existence, also with a function of our civilization and state, and here origin the central state of the federation which is shared and developed from all Federal states together. Every federal state have also all right's for own original function, bud the process of federation is open for our centralist connection and progress in our synchronization. All federal state, actively can support development of the central federal form of government and civilization, according the best options on the idea for progress, bud also together with a right on own state synchronization with the constitutional form of Central Federal government, use development options according the best opportunities in the Federal Center, and join the central government group as one equal government party. All states who join the federation, and one day also recognize on own process of central federalization, therefore also join a center of federation which is developed under their own option, and also, the central government synchronization in consequence meaning, therefore all another federal states again stand in the support on the best opportunity for development of the central federal state. Therefore, the Federal Center is a group which rise only according own best opportunities and options, made one most great nation of us, future the nation of all states, The One World. The Rule of Federation represent the system of Universal unity, when every state can join, and centrally synchronize His governmental order with the order of the Federation. Federation therefore respect International differences between governments, in their own system of political management, and also allow opportunity for better unification between us, without any change on the state mandate action or the system of own political recognization, and therefore our system of the Federation is equally open for every one. The Federation represent the first step of unitary connection, according the principles of the best available unity, without damages of national formation and state interest. 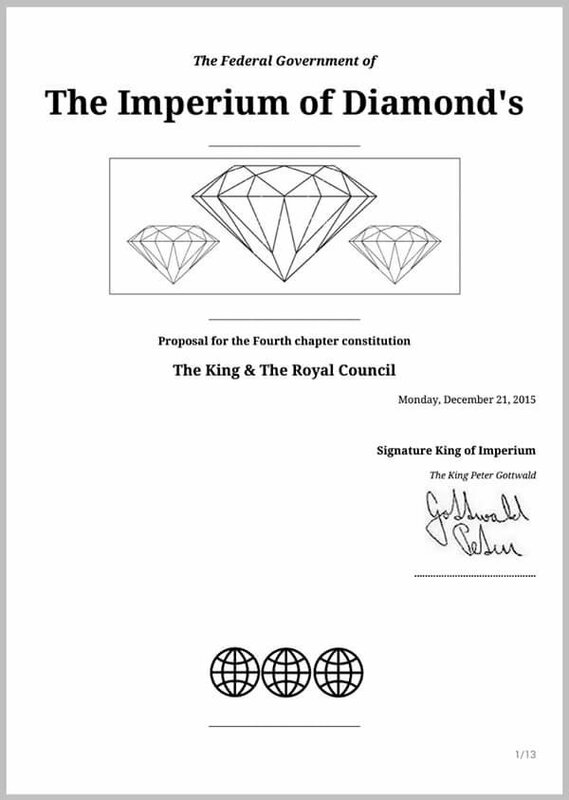 The federation consist the Council of Monarchy, which is open for every Monarchy family of state in the federation, also the council of Prime Minister's which consist all PM's of governments of Federation, Federal Senate for connection between all federal policies in the mean representation of state, and the Ministry is create be the consolidation of all ministers in the country, also the Federal Parliament and Federal Deputy Chamber, the Federation represent constitutional system of the unification of all nations and without their need for change on their formation of policy, and level of state position. Protection of Integrity, Internal source and Independence. Constituted system which allow stabile unity, federalization and function for all types of the governments in the world, also common Congress or prosecutor connection in the development of government affair, mean a Universal form of constitution create for every one. Strategy of connection and policy development on the level of Globalization, open opportunity for active connection between all states, and invite for federalization, or develop connection's between our states. Regime with immediately ability for interactive synchronization with global affair's, and own intelligence for recognization. Stabile legal connection between states and nation's, peaceful relation and stability, peace cooperation and protection. The Best opportunity for own existence in a form which open the best opportunity for global federalization with every one state in the world, and maintain stabile integrity of state, government and policy affair. The order of the federalization, and grow unitary state, from a level of Union. The system of equivalence of civilization level on modernity between all states in federation, according the norm of the best available option in Federation and opportunity for development. The Central Government is One group, neutral on political ideology, or opinion, only interest of real state & government existence and such need. The best opportunity for own development in all kind's of the nation, government, law, civilization. The Ministry categories in all kind's of civilizational existence, at a kind on the central subject of related affair. Intelligence development, and again expansion of all Ministerial functions, Authorities, and new departments. The Multi kind of Commission's and mass system for active intelligence development and organizing, civilizational and state planing, control and stabilize, develop and expand, strategize and calculate, actively found. Open multi cooperation of civil institution's in connection with governmental institution and department's with ministries. Open the Governmental center's for global connection on conferences and assemblies between foreign institutions, categorized between Bank's, Universities, Political parties, NGO's or Supranational Institution's and all institution's according responsible and strategic recognization. Open Governmental cooperation with Business companies and Business Region representatives, with the Government and coordinate governmental development of state be the common intelligence and people need's, managed strategies of organization. Right of Government, plan, regulate and direct state development according multi management planing between the civil institution's and available foreign entities. Development of special Governmental and Civil areas in un-touchability from active habited zones or another civil areas, the active development of special zones with own order, related for strategical need in level's of science, security, economy or trade, policy, and all available interested affair. Open right for state civil associations, organizations, societies and movement's centralization in public body of government, and coordination with Parliament of Government and Political parties. Global diplomacy cooperation for the Humanitarian support and security development, global humanitarian, peace and security organizing. Best system for prevention on economical destabilization, and reserve system's development. Re-publican system of the government affair activity and development, system of control-ship and intelligence development. System on stabile state centralization and mechanism on prevention agains't state and civil decentralization. Right for people and their movement, free opinion and believe, use all kind's of social, civil and state intelligence for new central development, according interest of people and such importance. One Government, One People. Stabile living qualities is guarantee for every one, by the modular law form and economy. Equal right between man and woman. Protection of child and family. Freedom of people and their development right, right on 100% state democracy in government affair, cooperative mechanism for state and governmental development, form of management for common recognization and development. Stabilization of currency and protect the strategy of development, inter-state investment properties activate development and International level control. Order of people which stabilize the order of civil function, equal right and duty for personal life development, study, work, business activate. Right for health guarantee for every one in all consequence of their own life situation or state action and strategy. Prohibition on self-death or death. Cooperation agains't all kind on genocide. Stabile modular system of lawfully autonomy mechanism for availability on the act of state regulation and maintain the state function according geography and source, population, consumption, competition, development and opportunity on intellectual progress. Active security control and isolation from all threaten of impact in crime or threaten. Active control of civilization, all kind's. Difference on statute of Government, Diplomacy, and War relation in legal meaning. Mechanism on autonomy stabilization of government and unlimited validity of government in all case, create by the legal law, code of people, open strategies for development and stabilization, active prevention and insurance system development with protection, also intellectual connection on the level of globalization. Currently We are plan establishment of more than 80 Constitutional & State Commission's for cooperative administration and intellectual development of the state. ...the Constitution development is under blockade be occupation.